Light: Trusting your feelings. Opening yourself to spirit. Accepting and returning affection. Getting in touch with what motivates you. Taking advantage of an opportunity to express love to others. Listening to the still, small voice. Shadow: Hiding your feelings. Spurning an opportunity to love or be loved. Numbing yourself to spiritual yearnings. Rejecting the counsel of your heart. Becoming a puppet of your own emotions. Indulging in hysteria or obsession. Story: The Main Character meets a love interest or discovers his or her true calling. Relationships. This is an opportunity to set logic aside and allow actions to be guided by feelings alone. Irrational? Perhaps. But in certain matters, logic does not apply. Be romantic. Be spiritual. This moment is a chance to see romance as an expression of spirituality, and vice-versa. Work. How fulfilling is your work? If you’re going through the motions, this card challenges you to get back in touch with what delights you. Find a way to integrate your labor with your dreams. If you’re already fulfilled, watch for an opportunity to take your satisfaction to the next level. Spirituality. On rare occasions, Heaven opens, and the Hand of God offers us the opportunity to experience unexpected spiritual highs. Pay close attention to the events around you; one is a seed—an opportunity to be uniquely and totally immersed in the work and power of Spirit. Personal Growth. How comfortable are you with expressions of emotion? Of faith? This card challenges you to be more open with both. A centered person freely shares what he or she feels, and a truly spiritual person can share his or her faith in natural, non-aggressive ways. Give both a try. Fortune Telling. Romance is in the cards! A new relationship or marriage is just around the corner. Prayers are answered. The Hand of God. On the Aces in Marseilles and RWS-inspired decks, a heavenly hand extends from the clouds, offering the viewer the suit’s distinctive marker. When opportunity comes your way, take advantage of it; the hand that extends an offer can always withdraw it. The Holy Grail. The RWS depicts the chalice as the Grail—the cup of the Christ. 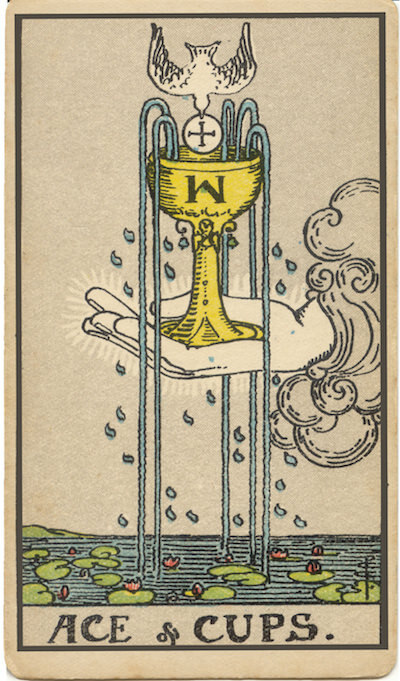 In addition to the spiritual connotations of the Grail, this card (like the Grail) can be connected with the Divine Feminine. What would your spiritual quest be? What hidden truths should you pursue? Cups as Symbols. As a suit marker, Cups suggest receptivity: they are vessels, waiting to be filled. Cups have long been associated with divination (remember the uproar caused when Benjamin stole King Joseph’s cup?) and, by extension, intuition. How can you enhance your own receptivity? The Nature of the Ace. Compressed into the Ace are all the qualities of all the other cards of the suit. In this way, the Ace can be said to be the “root” or “seed” of its associated element. How might your situation contain the seeds of emotional or spiritual growth? Your First Impressions. When you see the Ace, what’s your first impression? What will the cup contain? What actions are you expected to take? How would I go about opening myself to spiritual guidance? What motivates me the most—pleasure or pain? Why?